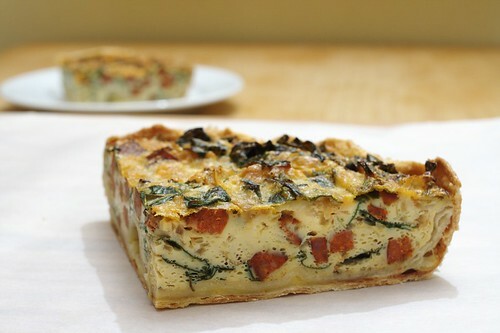 linguica and bitter green quiche with a stuffed double-bacon-fat-tortilla crust, originally uploaded by aarn! +7th November, 2010+. this here quiche has a stuffed crust. made some tortilla dough by cutting 4-5T. of bacon fat (no lard around and didn't want to use shortening), and some pepper and salt into 1c. of all-purpose flour, then cut in water until workable. refrigerated the dough for 30-minutes or so, and then gently rolled the dough into two large pieces (being careful to not incorporate too much of the fat - to keep it flaky), each big enough to cover a 8-in round cake pan. buttered the cake pan, placed a round of parchment paper in the bottom, then buttered the parchment. placed one of the tortilla shapes into the paper-lined pan, then sprinkled 1/8-lb of sharp cheddar onto the bottom tortilla, and covered with the second tortilla dough. trimmed the dough to the size of the pan. sauteed 1/2-lb of diced linguica in some olive oil until browned, then added five large leaves of collard greens (de-ribbed), and two small onions sliced into thin strips. seasoned with some salt and pepper and added 1/2c. white wine. cooked until the wine had reduced around the meat and greens, and the greens appeared to be wilting. beat eight eggs using a stand mixer, until foamy. used a spatula to gently mix into the eggs salt, pepper, 1T. fresh chopped thyme, the sauteed meat and greens, and 1/8-lb of shredded white cheddar cheese. poured the filling over the tortilla dough in the cake pan, and then used the spatula to make sure that everything was evenly distributed. put it into a 350-degree oven for about 35-min or until a cake tester came out clean (not sure how long it took). allowed to cool for a few minutes and served. Dude, why don't you ever cook when I'm in town? DROOL.